EXCITING NEWS! Our newest CD entitled “Home” is just released! 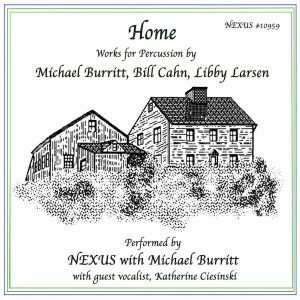 The album takes its name from the lovely “Home Trilogy” written for NEXUS by Michael Burritt. Michael is featured on the album as guest artist, performing in the “Home Trilogy” and also in Bill Cahn’s “The Crystal Cabinet”, and conducting our performance of Libby Larsen’s “DDT”. Also on the album is “This World” by Bill Cahn, featuring vocalist Katherine Ciesinski. “This World”, “Home” and “DDT” were premiered at the 2015 Percussion Rochester Festival in conjunction with Rochester’s Greentopia Festival in a concert themed on environmental sustainability. Grammy-winner Libby Larsen took her inspiration for “DDT” from Rachel Carson’s environmental manifesto “Silent Spring”. Bill Cahn’s “The Crystal Cabinet” was originally written for the Pendulum Percussion Duo – Susan Powell and Joseph Krygier – and later arranged for NEXUS.